Of course, as exciting as landing pages may have been a decade and a half ago, it isn’t hard to see why they fail to excite and inspire marketing teams of today. Building landing page after landing page for every target demographic, every product, and every stage of the sales cycle can be tremendously time and resource-consuming. And customers themselves may also be getting tired of traditional landing pages. The truth is that most consumers are smart enough to recognise a funnel when they see one -- and no one likes trudging through the processes of “getting qualified” as a lead. Customers don’t want to navigate a maze of landing pages and qualifying processes; they want answers now! The question is, how can you skip the funnel without losing all the benefits that traditional landing pages offer? Enter: conversational landing pages. The name essentially says it all -- conversational landing pages are intended to make customers active participants in a two-way exchange that helps both parties understand if they are a good match. Tom Wentworth, CMO of Rapid Miner and user of Drift Conversational Landing Pages, compared the process to a ‘“choose your own adventure,” and the metaphor is quite apt. Conversational landing pages use bots to learn what visitors are looking for and to direct them to the appropriate action. They can be used to book meetings, to spark sales calls, or to collect email newsletter subscribers -- all in real time. By replacing static traditional landing pages with dynamic conversation, you can improve visitor engagement, boost conversion rates, and create a better all-around customer experience. One of the great dilemmas that marketers everywhere face is personalisation versus efficiency. Making customers feel special in a scalable fashion is no small task! Fortunately, that’s exactly what Drift Conversational Landing pages can do. The level of customisation that can be designed into a landing page by Drift is limited only by your imagination and your knowledge of your customer base. And responding to the leads that do qualify is easier because, as we will discuss in the next section, these campaigns can save a lot of time. It should be pretty obvious how Drift conversational landing pages save your customers time. Comparing the real time nature of chatbots with the slow contact and response process of traditional landing pages makes it painfully obvious that conversion rates could be improved if companies just found more effective ways of communicating with their leads. 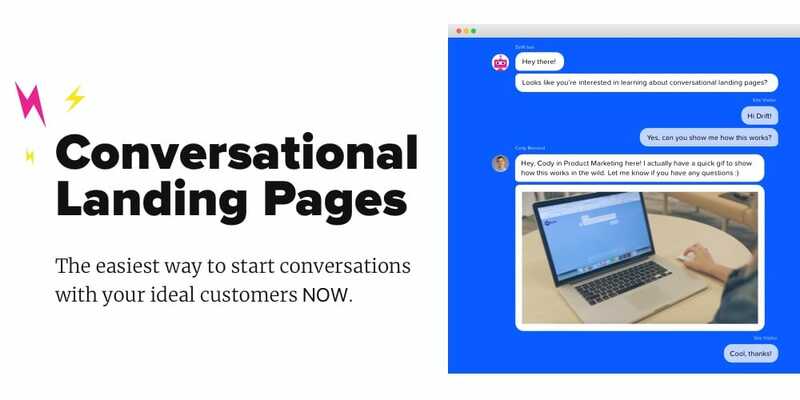 Conversational landing pages can also save you and your marketing team time by allowing you to focus on high-level, high-converting actions instead of sifting through leads, referring them to the correct person on your team, etc. Another great quality of conversational landing pages by Drift is that they are relatively easy to set up and to create rules for. This stands in stark contrast to many other powerful, tech-heavy tools that can require large amounts of time, money, and energy. If you’re looking to learn more about how Drift conversational landing pages work, then be sure to check out the help page that Drift built for the process - or, of course, get in touch with us here at Refuel Creative. We’ve come a long way from the days of emailing back and forth to find a suitable meeting time. Tools like Calendly and Schedule Once have brought us into the modern age, allowing calls and meetups to be organised without headache -- as long as both participants know exactly who they need to be speaking with, of course! When it comes to new leads who are just reaching out to your company however, that isn’t always the case. Leading a new visitor to the right person on your team can require lots of back and forth -- and if you aren’t quick enough, your hard-earned lead could end up getting in touch with a competitor! This is yet another advantage of conversational landing pages, as they make finding the right person and communicating needs easy for new potential customers. Chatbots work. This may come as a surprise to you if you’ve never come across an effectively programmed and created conversational interface or chatbot -- but if you have encountered a chatbot who made your experience as a customer easy, you know exactly why your company needs to get in on the game. Drift Conversational Landing Pages allow you to do just that. Contact Refuel Creative online today to learn more about how we can help you establish an effective conversational landing page system with Drift! We serve clients Australia wide, but if you are in the vicinity of Port Adelaide use the words “Refuel my marketing” in our chatbot to the bottom right of this window and we’ll drop you an invite via email to one of our regular client afternoons (This is code for drop in and have a beer. Our shout! ).